NASA's newest space telescope is preparing to expand to its full size today (June 21), stretching a giant mast that will open its X-ray eyes on the universe. 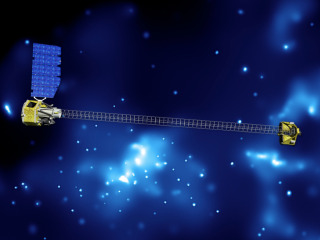 The NuSTAR (Nuclear Spectroscopic Telescope Array) telescope launched June 13 on an airborne rocket carried up from the South Pacific Kwajalein Atoll. The spacecraft, designed to hunt for black holes and other dynamic mysteries of the universe, has been going through checkouts in orbit since, and so far, so good. "It's going eerily well," William Craig, NuSTAR instrument manager at the University of California at Berkeley, told SPACE.com Wednesday (June 20). "All systems are completely nominal now; the instrument was turned on yesterday and it looks good." The mast is made of carbon fiber rods that will unroll in cube increments designed to snap into place to build the full extent. Now, they are all packed tight in a small canister, but when they are lifted out, they should form a very stiff, yet very light, structure. The mast is currently bolted down to the telescope's base, but when it's time, the bolts will be released and a mast motor will crank out the structure in about 28 minutes. "We've tested it multiple times, it's been deployed 21 times on the ground, but obviously this is the one for show," Craig said. "There will certainly be nervous energy in the room." Once the mast is stretched out, the next and last setup step for the fledgling telescope is to turn on its X-ray detectors. That milestone is scheduled for Friday (June 22). "We're using Cygnus X-1 as a calibration target, but there's science data there as well," Craig said. "We'll actually be doing the first bit of research as early as next Tuesday or Wednesday." The observatory's official science mission starts at its 30-day mark in orbit, or July 13, mission managers said.